Head man of the Karaites of the Crimea in the first quarter of the nineteenth century, and president of the Karaite Council of the city of Kozlov, Eupatoria. The exact date of his birth is unknown, but he was probably born about 1785. 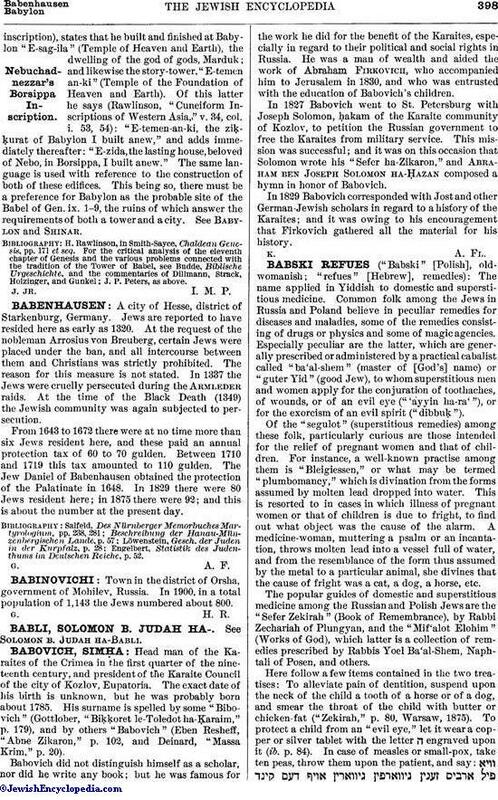 His surname is spelled by some "Bibovich" (Gottlober, "Biḳḳoret le-Toledot ha-Ḳaraim," p. 179), and by others "Babovich" (Eben Resheff, "Abne Zikaron," p. 102, and Deinard, "Massa Krim," p. 20). Babovich did not distinguish himself as a scholar, nor did he write any book; but he was famous for the work he did for the benefit of the Karaites, especially in regard to their political and social rights in Russia. He was a man of wealth and aided the work of Abraham Firkovich, who accompanied him to Jerusalem in 1830, and who was entrusted with the education of Babovich's children. In 1827 Babovich went to St. Petersburg with Joseph Solomon, ḥakam of the Karaite community of Kozlov, to petition the Russian government to free the Karaites from military service. This mission was successful; and it was on this occasion that Solomon wrote his "Sefer ha-Zikaron," and Abraham ben Joseph Solomon ha-Ḥazan composed a hymn in honor of Babovich. In 1829 Babovich corresponded with Jost and other German-Jewish scholars in regard to a history of the Karaites; and it was owing to his encouragement that Firkovich gathered all the material for his history.